BMW’s Markus Reiterberger had a tough re-introduction to WorldSBK racing last winter, finishing over two seconds off his new team-mate in the early stages. 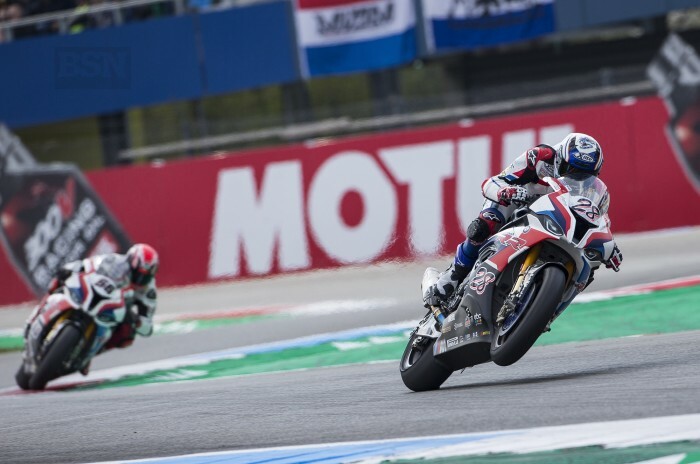 He regrouped and on what is clearly a strong WorldSBK package now, and will be even stronger in the future to the point that at Assen, Reiti beat his illustrious team-mate Tom Sykes in not just one race but two. Third off the grid, and with some engine updates as he had in he Motorland Aragon round, Reiti held second place in race one until lap eight, then slowly dropped back to sixth. He would then follow that up with second sixth place, with Sykes right with him across the line, but only 0.018 seconds behind. A real sign of progress from Reiterberger – and he thought his could be a good weekend for him, just not quite this good. “I know Assen is a good track for me and I expected a lot from here, but to be honest I was hoping for a top ten because the first few races were really difficult for me. Beating Sykes must have been good for the tall German rider’s ego though? “Yes sure but the second race was really close and I just tried to survive,” said Reiterberger about holding on for sixth for the second time. “The last laps I did not feel so good with the rear when I lost some time behind Haslam. But it is a good direction and the bike is working on the same level for both riders, for me it is really important to be close to Tom. Reiterberger made bike changes between the Sunday race one and race two. “From first to second race we made a small change in the balance of the bike and my consistency. At the end Haslam was doing one or two slow laps and I could not pass him so fast, so I nearly lost my sixth position. “It would have been interesting in the end to fight with Davies for the top five. The track was working good but we just have to help the tyre for race distance with the setting of the bike. In the morning it was really cold and it was a big risk to use the soft tyre but I felt really good in the Superpole we did. Losing a lot in one of his starts, Reiterberger is keen to get that sorted between himself and his team. “The first start was really good and I was one of the first releasing the clutch but in the second one I got a small wheelie the revs came down and it was not a good start,” he said. After new electronics and a first engine tune of the season, Aragon was an improvement, Assen a jump, but for Reiti the immediate area to focus on to continue moving forward now is clear.